I love happy accidents, don’t you? 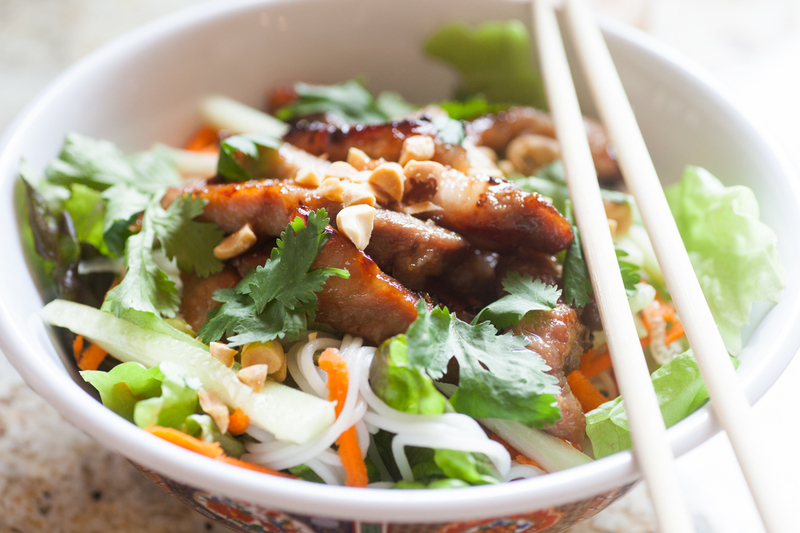 My favorite salad is a Vietnamese vermicelli salad. I mean, I LOVE this salad. Generally, I make mine with curry chicken (or tofu), but the other day I was craving pork. Having never made a pork version I wasn’t really sure what to do so I googled, and googled, and googled. Finally landing on a recipe that had what seemed like clear instructions, and they probably were, but I fucked them up. Bad. Luckily, the pork Gods were on my side when I started to cook the pork, because it turned out perfect. Please note, this is a long process, but it is so worth it! It’s become my meditation of sorts, and bonus is that all of the ingredients are the same as summer rolls so you can make both! Mix your marinade up and add it to a ziplock bag with the pork. Refrigerate overnight. I usually do all of this one to taste. You can always use the extra for salad the next day or even for your summer rolls. So this is where I about messed up my pork but found this method was awesome! get your skillet and put some oil in there. A little more than you think you need. Maybe 2 tbsp. Let that get hot over a med high heat and add your meat. It will get watery but let it keep cooking. Discard your marinade. Eventually it all cooks down and the meat will start to turn all sticky and golden brown. PERFECT! This is the easy part, I promise! Layer your bowl starting with lettuce, then noodles, then carrots and cucumbers, then pickled goodies, next the meat. I like to finish with cilantro and peanuts. *another step here is to pickle your own daikon and carrots.